Normally I wouldn’t joke about the break-in of an unmarked KCRA news van earlier this month. But in this otherwise positive report about homicides being down 42% since 2008, KCRA references the burglary of its van to tie the incident to crime trends that “depen[d] on the neighborhood.” Did the crooks actually steal the vehicle, leaving KCRA able only to report on news that happens at KCRA? I’m kidding, of course. The vehicle break-in happened in Natomas which today’s report points out is experiencing a major increase in vehicle burglaries. I sure am glad the van didn’t get stolen. I don’t know what I would do without the roadside weather report from Blue Canyon. I really like it when the reporter picks up a handful of snow to prove that it really snowed at Blue Canyon. If only the Apollo guys had done this, maybe I would be able to believe that men actually landed on the moon in the summer of ’69. And I suppose that part of the KCRA story about fewer homicides in Sacramento is good news too. Cogmeyer: Nobody was going to steal a KCRA van. In fact, it wasn’t even a van. 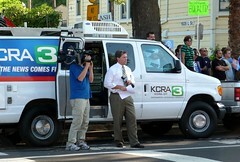 It was an unmarked SUV that KCRA occasionally uses for shoots that don’t require a liveshot (no antenna on the truck). They look just like your ordinary Jeep Cherokee or Ford Explorer. The thief broke in to steal a camera, which was bolted down by the photographer. The photog wasn’t even on duty — he was on his lunch break. Good thing your sense of humor is bolted down.